Christmas Eve we attended the church we went to 20 years ago, oddly, before I was saved. We normally attend this church Christmas Eve because they have the pomp and circumstance we expect for Christmas, including the Candle Light singing of Silent Night at the end of the service. I love that. We miss that tradition, so we attend. The last few years the message has drifted further and further away of the real Jesus, and closer and closer to the "Jesus was a good example of good people," type of Jesus. I don't believe 100% of the Bible is literal, but I do believe that most of it is literal, as far as translation and historical context will allow. I also believe that it is the word of God, not the word of man or religion, so we have issue with Jesus as only a Good example, unless he is also Real and God. So we did not expect much from this service. We were there for the pomp, and the candles and the singing of silent night. It's funny, God seems to know when I am being cynical, and shows up just to let me know I am being a putz. He showed up Christmas Eve, and the pastor taught me something I had never quit thought of before. It is still setting me back and making me think. I have waited a week to write this down, for fear that I imagined it. I didn't, so here goes. In business, most Christians set goals, because as we all know, "you can't get there, unless you know where there is". Imagine, I was once told, where Christoper Columbus would have ended up if he left Spain without a plan. Wait a minute, I always think, he did have a plan. He was going to sail to India, and prove the world was round. He failed on the India part. He found Hispaniola instead. Yet, most people still think goal setting is required. This mystifies me. One of my friends, someone who used to be one of my spiritual role models, and is, in fact, one of my spiritual parent, is a real good example of goal setting gone wrong. He told me he decided he was going to have 500 or 600 hundred karate students. He prayed about it. He decided God agreed, so he set about writing a plan for getting 600 student. He almost made it. See, God helped him reach his goals. I do not see it that way. This, in retrospect, is how it looks to me. He decided what he wanted. His goal. The he spiritualized it, by asking God to help him achieve it. That is kinda like looking in the mirror and scrutinizing what you see, compared to what you want to see, in the light of Christ. When you see the difference, you go about make cosmetic changes, to bring the image of you closer to the image you want to see. That, for sure, is way better than never looking. If you just did what you wanted to do, and never checked your behavior or your motives against the Word or the Spirit (the mirrors in this example), you would be living as most people, and most Christians do. You would be living on your own power. So what he did, by checking his behavior in the mirror, after he had decided what his behavior was going to be, is a level of maturity that most of us do not have the courage to achieve. So I followed him, for I was not even close to being able to do that at the time. It did not work out so well. Goals kept feeling like me holding up my own power and plans to the Lord, and asking him to bless them. You know what I mean, I think. An example would be, Lord, I took this job because it gave me a chance to earn more money. Thank you God for giving me this blessing. Please help me reach my income goals so I can be a better (father, husband, wife, mother, provider.) It seemed like I was asking God to Bless MY plans. So I stopped. I began asking God to tell me what I should do. I don't "hear" God, or "see" God as some people do. I see him in my history and the blessings that occur around me, and in the nudging I get in prayer and from my pastor and fellow Sunday School teachers, my students and their families. Or, sometimes, from the overwhelming conviction that a certain behavior, lesson or action is necessary of me. Then I do it. Then, during one of my spiritual crisis's, Christmas arrived, and we went to the service I mentioned above, for the pomp. The pastor said, freaking me out quit a bit, "most Christians see Jesus' life as a mirror. I encourage you to see it as a window." Don't decide to look at what you already are, and what you are already are doing, and then change it based on what you see in the mirror, when you read the bible or contemplate on the life of Christ. You see, I had finally discovered how to use Jesus as a mirror, and I thought of it in those words. It was like he was talking to me. I really hate when that happens, as it is happening, because it is hard for me to remember that it is the Spirit of the Lord rather than him actually knowing. Paranoia is also part of TBI. I wanted to get up and leave. If I could have, without being noticed I would have. 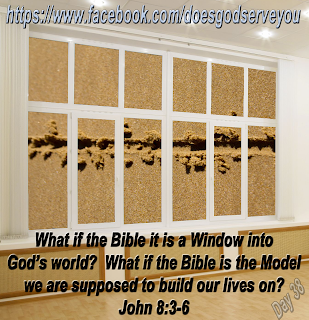 Rather, he suggested, look at the life of Jesus as a Window into the world of Jesus, the only perfect man, and START everything in your life with what you see in through the window, rather than modifying what you are already doing. Don't decide what you want, and then go do it, but rather see what Jesus would do and want, in your situation, and go do that. Have faith, he encouraged us, in the life of the Christ, and model your life, your business and your actions after him. Do as he would do. So, instead of putting a band aid on you actions, that you have decided on, and you have controlled, build the New Man, and rebuild from what you see through the window of the Bible and Jesus' life. But, I hesitate to write the next part. Honestly, for me, knowing that you need to model your life after Jesus is ground breaking, but nearly useless. It is almost to the point of Christian Ease or Slang, which reminds me of a video that one of my friends posted a link to on facebook.com. I show it to you here, for you amusement, but also so you know that I, and perhaps you, are not the only one that hears the words, understands the words, but have no idea how to do it. 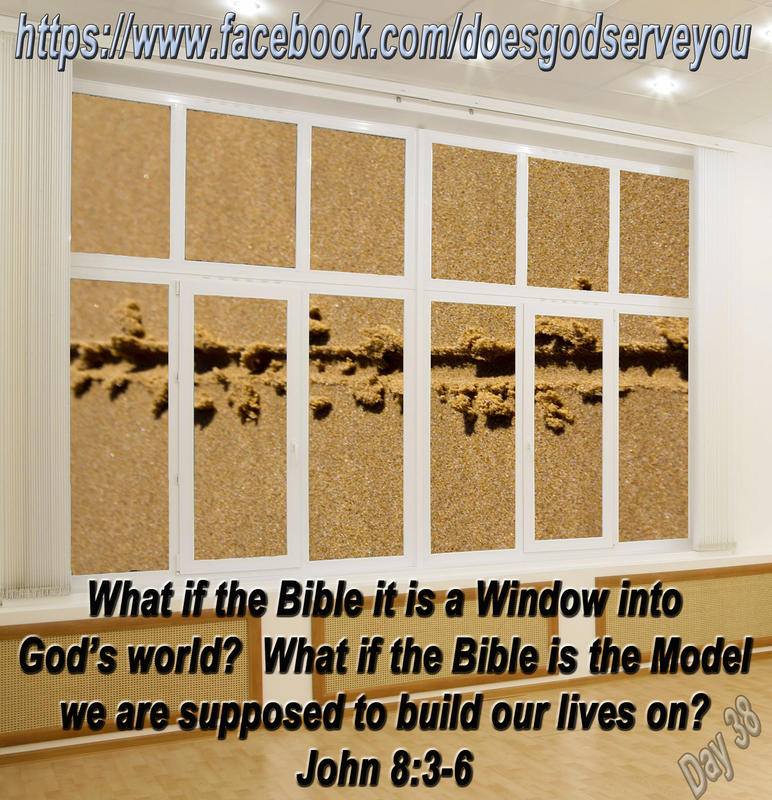 So, since this was such a kick in the pants to me, I am going to share with you how I can do this through the window modeling, without turning it into Christian Ease. I have friends, a spouse and and adult child who are all strong Christians, to whom I go to for advise. My personal board of directors, if you will. This is critical for me, since I have a major brain injury, and I live in a world of self doubt, confusion, loss of impulse control, depression, migraines, illness and paranoia from the dark side of hell. I find it hard to see good in anything I do but find it easy to see the harm and evil in everything I do. And yet, I have just begun to see through the window, and am beginning to model my actions after the Lord. I found out what my gift was. Jesus was the disciples pastor. He guided them, pushed them, and told them when he had to, what to do and not do. I asked and still ask my pastor, and my "board of directors," what my gifts are. Nearly every day. They have to be sick of telling me, but that is the life of TBI. I am still in shock that I can teach, when before and after teaching and Sunday School, or at karate, I am ill. I immediately seek feedback, so I don't spend too much time under the covers in my bed, hiding from reality. They told me my gifts. You should ask your family, pastor and friends what your gifts are. They can pray about it, but they probably already see it. I am told, that we are the last to know what are gifts are, because they seem so natural to us. I teach as I breath, without thinking or effort, so I would never have know. You should be thankful for your Gift to the Lord. In that act of being thankful, you admit that you are aware of what God wants you to do with your life. It is really hard to ignore God's plans for you if you know that he knows that you know. So thank him, with words, in prayer. Every day, or as the Bible suggests, always. Thankfulness is also good, because it prevents ego from getting in the way. It is really easy, once you know you are good at something, Holy Spirit good, to look at others and notice they are NOT good or at least not as good as you. The next most natural reaction is to take credit for it yourself, and rub other peoples faces in it. That is nuts. Be thankful, and your Ego will stay in check. I have done it many times the ME way. When I finally discover how pompous my actions and life has become, it hurts. In my case, it drives me away from everyone, as depression and paranoia take over. Be thankful. Ask for wisdom in using your gift. Clearly, one of the things you see through the window of the Bible is Solomon asking for wisdom to use the many gifts that God gave him. How well did that work our for him? He lost control of his ego, even though he was the wisest man that would ever live, short of Jesus. He lost control. We have the Holy Spirit, thanks to Jesus' sacrifice, so we have a power he did not have to draw on, but even he asked for wisdom. Model you life after that picture through the window. I ask for it daily. It slows me down, and allows me to see, feel and understand the Spirit actions in my life. I have been told that "feelings" are not good to follow, but recently, I have begun to feel the spirit is my life. It is kinda super cool. So, live your life by looking through the window God has given us into how we are to live. Model your future life by that picture, rather than changing superficial behaviors or justifying current actions. God already has a plan for you, and it is Up to Him, if it is going to be. You just have to look through the window, and do everything you can to follow the example.